The Future Farmstead at the UGA Tifton Campus is the farm home of the future being built today, using the latest in high efficiency construction design and insulation, solar thermal and photovoltaic technology, geothermal heating and cooling, and an edible landscape. 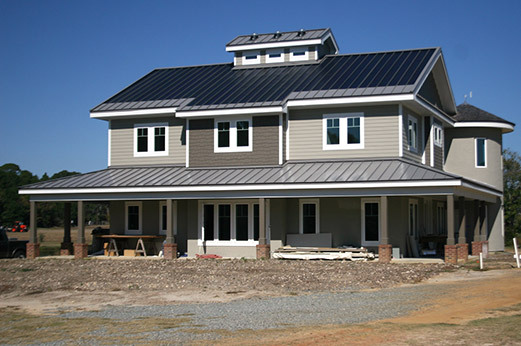 Designed and constructed to be a net zero energy home and net zero in water utilization, this farm home will be the home of graduate students who are studying renewable energy technology. Loaded with sensing technology, the home will be used to test the efficiency of energy generation. In addition the home will contain technology which allows the farmer to monitor and control many aspects of his farm from the home, saving energy, time and fuel. Many components incorporated into the home are available on the market today, making the use of much of this test bed feasible for the near future. This fascinating farm home demonstrates how a comfortable home will cost very little to operate and will enhance the farmer’s ability to manage his operation.